The left-wing party leads Finland's two main opinion polls with about 19 percent of the vote, having campaigned against the austerity policies of Center Party Prime Minister Juha Sipila and his Finance Minister Petteri Orpo — leader of the conservative National Coalition Party. But the far-right Finns Party, led by hardline MEP Jussi Halla-aho, has seen a surge in support in recent months during an anti-immigration dominated campaign, urging people to "Vote for some borders." "There have been a lot of cuts and some, like education, in areas they promised they wouldn't cut. Of course, the parties from the last government are going to suffer because of that now," she told AFP. Another voter, Katja Katajamaki, told AFP she felt the government's austerity had gone "too far in some ways". "I don't think that you just fix the situation with spending cuts," she said. FILE - Finnish Minister of Finance and National Coalition chairman Petteri Orpo (L) and Finnish Prime Minister and Centre Party chairman Juha Sipila attend a news conference at the PM's official residence Kesaranta in Helsinki, Finland, June 12, 2017. Petteri Orpo, leader of the conservative National Coalition Party and co-architect of the government's savings program, has denounced the Social Democratic Party's anti-austerity plans as "irresponsible". 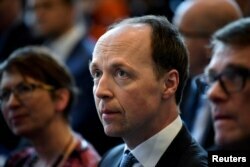 FILE - Finns Party leader Jussi Halla-aho in Helsinki, Finland, Feb. 27, 2019.